Apple has announced the last waltz for Ping, its social music network, after adding greater social-networking integration to iTunes. The company will shut down Ping on September 30, Apple announced the closure today on the Ping channel on iTunes. The company also announced today that iTunes 11 -- the software's next major release -- adds more sharing options for Facebook and Twitter, including showing music likes and recent purchases. An Apple representative noted that any playlists users made within Ping will be converted to iMixes, the company's publishable playlist format. However, the feature will become unavailable, and users will lose any followers, or people they were following, come September 30. The Ping page already redirects to the main iTunes page. Ping lets users post music tracks and albums to a feed to which other users can subscribe, viewing them from within iTunes on the desktop and on iOS devices. However, the launch of Apple's music-centric social network within iTunes 10 was largely considered one of Apple's recent missteps. 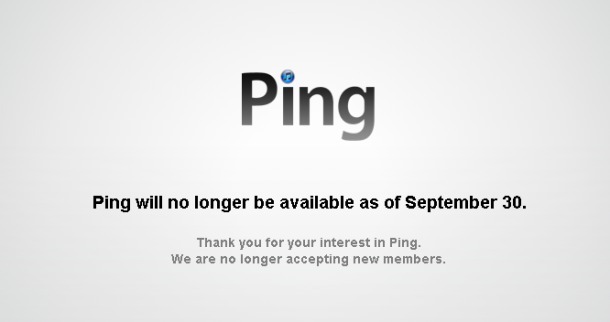 Apple CEO Tim Cook hinted at Ping's demise in June during an interview at the D10 conference. While admitting that he did not want to be questioned about the service, Cook noted that the company's customers found it lackluster. "We tried Ping, and I think the customer voted and said this isn't something that I want to put a lot of energy into," Cook said. "Will we kill it? I don't know; I'll look at it."